According to a recent IDG Research Services poll, 75 percent of U.S. organizations consider IT-business alignment a primary concern, while 35 percent of those organizations have difficulty mapping business goals to the way IT works, and 31 percent say they have insufficient monitoring and management capabilities. A modern approach to bridge this gap is by using a common set of performance metrics that link applications, services and transactions to the underlying infrastructure. With visibility into transactions, both external customers and internal users benefit from service levels that matter to them. That's critical because at the most basic level, transactions are the most important function of the business, and visibility into where those transactions are succeeding and where they are failing directly affects productivity, revenue and customer retention. 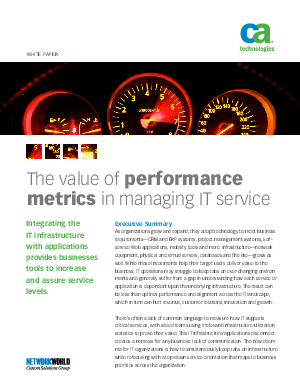 This white paper describes an approach that provides these performance metrics for specific IT stakeholders, all drawn from data collection and analytics that support a holistic, integrated approach to optimizing IT service delivery.